The records kept tumbling on the final morning of qualifying at the Oceania Track Cycling Championships in Invercargill today. 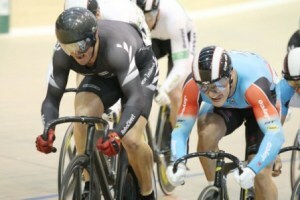 It was the chance for the sprinters to shine, with four New Zealand records broken at the ILT Velodrome. New Zealand’s burgeoning sprint cycling programme received a thumbs up after a record-breaking week at the Oceania Track Championships in Invercargill tonight. Twenty-year-old Aucklander Sam Webster capped their performances with a breakthrough victory in the men’s sprint at the ILT Velodrome. The new Olympic event of the omnium produced some close racing on the penultimate morning qualifying at the Oceania Track Cycling Championships in Invercargill today. Big Manawatu sprinter Simon Van Velthooven showed real maturity in his young career with a superb victory in keirin on the third night of finals in Invercargill tonight. The 22-year-old produced a massive effort in the final thrust at the line to edge out Australian champion Scott Sunderland. 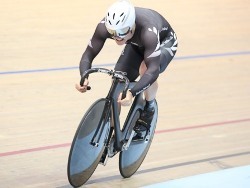 New Zealand’s world championship medallists Jesse Sergent and Alison Shanks set themselves up for another super-fast night on the second day of the Oceania Track Cycling Championships in Invercargill. 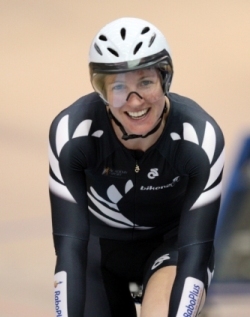 Alison Shanks pushed her way into the top echelon of female pursuiters of all time with a record breaking effort at the Oceania Track Cycling Championships in Invercargill tonight. Shanks produced a stunning 3:28.475 effort to claim the title, and shatter the New Zealand residents’ record. It proved a record morning for New Zealand cyclists on the first day of the UCI Oceania Track Championships in Invercargill today. Friday’s combined Junior and Senior race night proved great fun. Here are the results from this week's Wednesday Worlds held on 16 November 2011. Southland was once again thrust into the national spotlight thanks to the tireless efforts of a sporting club delivering New Zealand’s premier cycle race, writes CEO Nick Jeffrey.